You simply cannot do this and remain in the European Union. Freedom of movement really does mean freedom of movement. This is just window dressing. Saying that they’ll pass a law, a law that they know will actually be illegal and which will get struck down. Cameron is a social democrat living a lie as a Conservative. The sooner the CPP grow some and defenestrate the lying weasel the better. Its the way our politicians use slight of hand to hide the fact that Westminster has no real authority over great swathes of legislation affecting every area of our lives. He must know full well that he cant renegotiate terms of our remaining in the EU without first invoking Article 51 of Lisbon saying the country wishes to exit, the one thing he says he would never do. And yet the lie is still repeated ad nauseum. Grief! Look at Syria, Nigeria, Somalia, etc., let alone Bulgaria and Romania. If you want to provide a better future for yourself and your family, you will beat a hasty path to a safe haven in Europe or America. This isn’t going to change during our lifetime, whatever the cosmetic change to immigrations laws. Well, they tried putting real conservatives as head of the party before Cameron and remained utterly unelectable. The number of people who would vote for a real conservative remains low, and the evidence of the election results is that the electorate overwhelmingly prefer this soft, woolly, social democratic shite brought in by Blair and continued by Cameron. What your seeing now is what people want: the Milliband supporters want pretty much the same thing, only with some tinkering around the edges. A friend of mine says that women getting the vote has been a disaster, and I used to think it was crazy talk, but I’m starting to think he has a point. Women vote for more spending and for the sort of men that they see as good father material like Blair, Clinton, Obama and Cameron. All the women in my family are fairly staunch old school Tories, regrettably a bit illiberal on some social issues but very sound on the finances. I’m not tarring all women with the same brush. Some are better than others, but if you consider the overall effect of women’s votes on the sort of governments you get, they’ve not been good. Go into Boots and stand near the homeopathy counter and look at who goes into crystal healing shops. These are people who get to vote and they’re overwhelmingly women. How rationally do you think they pick their candidates for election? His pants are on fire, aren’t they? The French manage to deport Roma to Slovakia. What’s surprising is how late Cameron comes up with this wheeze. If it’s not going to flay, why should he care? But to fly the kite AFTER the elections is just plain stupid. Cameron’s ok here because the BBC, Libs, and Lab will not say that he’s lying his head off, as Cameron’s pose aids the media and Westminster narrative. But for people like me, it shows he’s Blair2, willing to lie his head off even if its blindingly obvious he’s making it up as he goes along. You simply cannot do this and remain in the European Union. This along with about a dozen other major amendments are all part of the renegotiation that Angela, Hollande, Rajoy, the EU’s latest governor for Italy, and the rest of them, are all going to whiz this through and sign off and agree in 2016 straight after our next election. That’s what we’ve been told? Not so. Thatcher was a true conservative and won three elections (with a bit of help from Galtieri). The problem it seems to me is that in the age of the 24 hr news cycle, politicians of quality and integrity can’t make it to the top. True, but that was a long time ago. The electorate has very much changed. As was the goal of the Blair government – population replacement. I am not sure the English electorate has changed much. But there is a much smaller percentage of English people in it now. 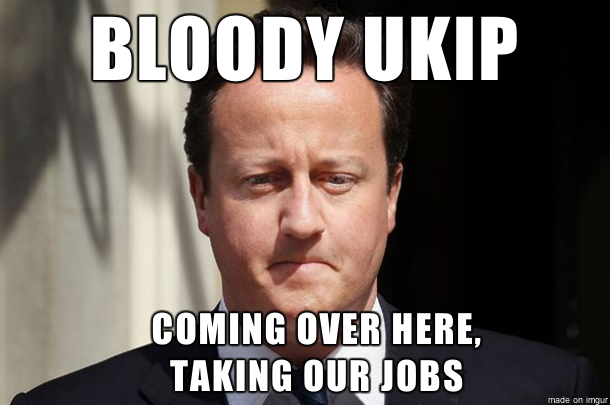 So of course Cameron doesn’t want to restrict immigration. He wants all those Romanians to vote for his brand of Lib-Dem tripe. So the way “to combat the rising popularity of UKIP” is to lie again but harder. Does the phrase “moral bankruptcy” mean anything to these people? Maybe Tim, but actually if it’s a policy that the majority of the country endorses, then this could be a useful exercise one way or another. Bear in mind the other trend, as reported by Ipsos Mori, that as support for Ukip has grown *support for actually leaving the EU has fallen*. The boots in the face aggression of kippers leaves plenty of us cold.